Shockingly! How selfie could risk up to the life of a Hyderabadi man. This shocking news has come from Hyderabad on 24 January when a crazy man was trying to pose a selfie with a speeding train. But his fun turned into the disaster as he got hit by the train. 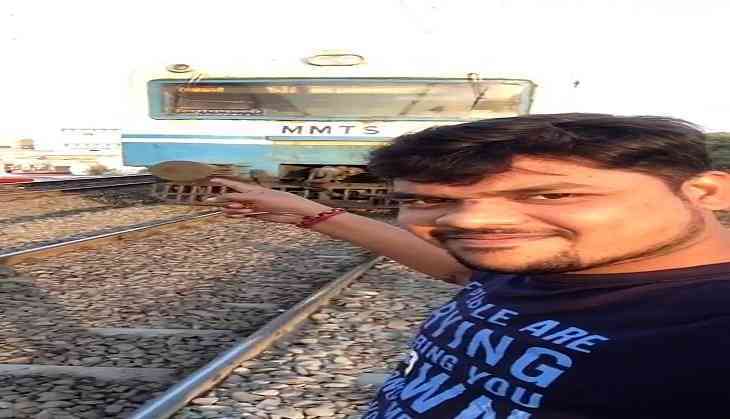 The man named as Shiva was filmed a video standing by the tracks in the Lingampally area of Hyderabad and he was smiling and keeps his right arm pointed towards the running MMTS or Multi-Modal Transport System train approaching to him. All of sudden, train smashes into him from behind and he was badly injured after getting hit viral in a video. This shocking video was viral over the internet on 24 January.